Mix bus compression. Do you do it? Should you do it? First off, let me explain what I’m talking about. When you’re mixing a song, regardless of what DAW you’re using, all of your audio tracks are being fed into a single mix bus. This is normally represented by a master fader of some sort. However, a lot of mix engineers use some sort of compression on the master bus. They’ll slap a compressor or limiter on the master fader. There are several reasons to do this…and not all of them are necessarily “good” reasons. Let’s take a quick look at a few examples of why you might want to use compression on your entire mix. Scenario #1 – You’re client wants a demo CD to play in the car. What your client may not know is that the audio on a finished, mastered CD has gone through a LOT of compression. Her music will need to be both mixed and mastered before it will be at a relatively “normal” volume. You can try to explain this to her, and explain why it’s not a faulty recording, but there’s the chance she may start to doubt you a little. I know, I know. This is probably an extreme example, but it can certainly happen. For this reason, a lot of engineers will simply throw a compressor and/or limiter on the master bus right before bouncing the song down for the client. Since the client knows it’s a rough mix, she won’t expect it to sound perfect, but at least it will be plenty loud. Scenario #2 – You want your mixes to sound like they’ve been mastered. In the first scenario, we applied compression/limiting to the mix for the sake of the client, NOT the mix. However, as you’re working on a project, and listening to your various mixes, you may get the urge to squash them with some compression and limiting to make them sound more like a “polished,” finished, mastered recording. Here’s where things can get dangerous. Now you’re changing the sound of the mix. Mixing and mastering were meant to be two completely independent phases. When you start trying to mix AND master at the same time, you’ll inevitably do a poor job of both. What ends up happening is you use too much compression, and you begin to rely on the compressor and limiter to achieve that “sound” you’re going for. This is a backwards work flow. You should use the normal methods of mixing — EQ and compression on individual tracks, effects, automation, etc. — to make your mixes sound good. As soon as you start relying on the mix bus compression to save you, you’re going down the wrong path. This isn’t to say you shouldn’t use ANY compression during mixing, but you need to be clear as to why you’re using it. Keep mixing and mastering separate. 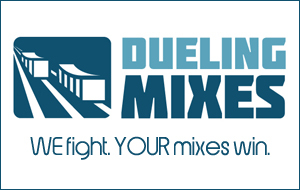 Scenario #3 – You want something to help “glue” your mixes together. The reason I do this is because the compressor causes everything to “stick together” a bit better in the mix. It’s the glue that holds my mixes together. It helps my mixes sound more like a mix and less like a bunch of individual instruments. Use it from the beginning. – You should instantiate your bus compressor VERY early in the mix process. Don’t wait until the last five minutes to throw it on there. If you do, the compression will essentially “undo” everything you’ve been working on for the past few hours. For example, you could have an amazing balance going on in your mix, but when you add a bus compressor, suddenly the lead vocal seems lost, and the shaker and high hat are too loud. Use the compressor from the beginning, so you’re making all of your changes while listening TO the compressed signal. Don’t use it “just because.” – If you’re happy with your mixes, don’t start compressing everything just because you can. It’s much easier to over-compress something and make it sound worse than it is to just leave it alone. Be very conservative with any bus compression you do. Don’t use a limiter. – Limiters should be left for the mastering engineer. Ask your mastering engineer. – Contrary to what some people say, a lot mastering engineers don’t mind if you send them a mix that’s been compressed a little bit. In fact, some say that it’s easier to master a song that’s been lightly compressed than one that hasn’t been compressed at all. Keep in mind, though, that if you go overboard with compression, you’re making the mastering engineer’s job much harder, and you’re giving him less room to work.